In a recent Embarcadero webinar, Marco was demonstrating some new features of Records, including a new Assign operator that can be overloaded. Afterwards I had a number of questions from people asking what it was all about. Why do we need an Assign operator? Why would you want to overload an operator anyway? After a bit of a discussion with them, I realised that rather than me trying to throw off a couple of sentences to explain it, I should probably write up something clearer. If you already know what operator overloading for Records is, then this article possibly isn’t for you. But if you’ve seen this mentioned before and not been really sure what it was all about, then hopefully this article will help. I should note that Operator Overloading for Records has been in Delphi for quite awhile (Delphi 2010 I think). 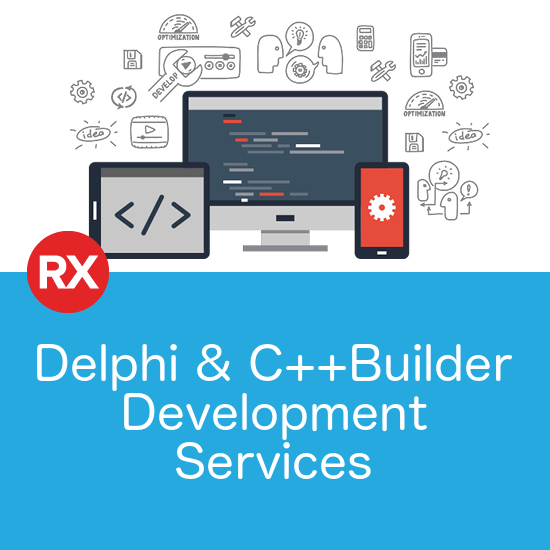 If you’ve got a relatively recent version of Delphi you can do everything I do in this article. This is an extremely simplified example, on purpose, but imagine some of this code is off inside methods of a class and some is calling code in another class. Even though I’ve named the variables to indicate their unit, just to try and make it obvious, it’s still going to be pretty easy to pass in a value in the wrong unit. What I’d really like is for the Delphi compiler to check the units for me, and throw a compiler error if I mix them inappropriately. But I still want to keep the nice, clear syntax in the calculation above. Hmmm, two steps forward, possibly 3 or 4 steps back. but the price we’ve paid is to lose some of the clarity of our calculations and assignments. All those .Value’s scattered around the place are pretty ugly. Let’s fix our compiler error by changing our TInch variables to TMillimetre (don’t worry, we’ll revisit these later to see if we can auto-convert them) and see what we can do to get some of our clarity back. Why can’t we just remove the .Value calls? If we try it, the compiler will throw an “Operator not applicable to this operand type” error. The operator in question is the + operator. Why? Because it doesn’t know how to add two TMillimetre records together. Integers, Doubles, even strings, no problem, but not Records. So we need to teach it how, and this is where Operator Overloading comes in. We need to overload the Add operator on our TMillimetre so that it knows how to add itself to another TMillimetre. It looks like a function, but it’s an operator instead. 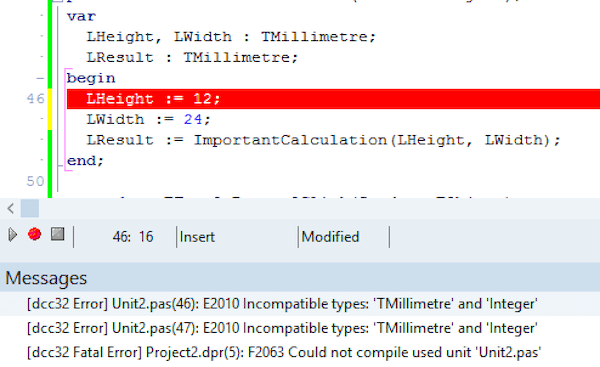 When the compiler sees we’re trying to add two TMillimetre records together, something it doesn’t know how to do, it will call this method for us instead. In the implementation we just need to do whatever is necessary to add those records and return another TMillimetre. However, be careful to return a new TMillimetre and not to change either of the records passed in. After all, it would be a little odd if a := b + c ended up changing b and/or c in the process. Add isn’t all we’d like to do of course, we might like to subtract, multiply divide, etc, so there are operators for all those as well. There’s a full list in the docs. Now when the compiler sees an attempt to compare two TMillimetre records with the = operator, it’ll call our Equals method instead. Why am I using the SameValue function from System.Math instead of just comparing the two .Values? Because I’m storing the Values as floating point numbers, and so I want to do a “close enough” comparison. Check out this page in the docs for more details. This time, it’s saying it doesn’t know how to convert between 12 and a TMillimetre. If you look through that list of Operators I linked to before, you’ll see two in there with weird names: Implicit and Explicit. These operators let you teach the compiler what to do when something is cast to or from our record. In my experience, overloading the Implicit operator also allows Explicit casts to take place, so generally I only overload Explicit when I’m not overloading Implicit. ie. I want to allow Explicit casts but not Implicit casts. Now with that last trick we’ve taught the compiler, we can finally get back to my original goal. We can write relatively clear code without a mess of .Value calls dotted all around the place, but we still have the compiler there making sure we’re only using compatible types. Whether or not you want to write code like this is not the point. 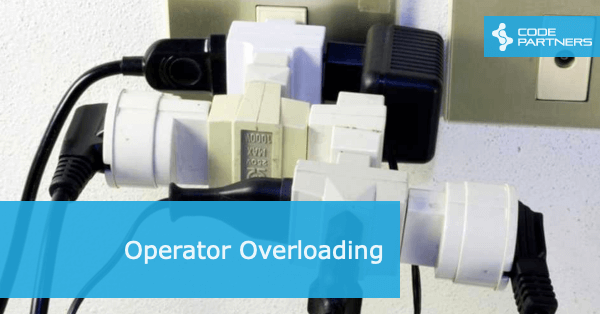 Hopefully this has helped you understand what operator overloading is, and one example of the kinds of things you can use it for. We can actually take this one step further. Right now this example prevents us from adding a TInch to a TMillimetre, but given what we already know about operator overloading, we could extend it to automatically convert between them. That’s what we’ll do in the next post. My BigInteger, BigDecimal, BigRational and Decimal types all nicely demonstrate how you can use operator overloading. BigIntegers would be much less intuitively usable without it. You could use Java style, e.g. X := a.Multiply(b).Add(c);, but IMO, x := a * b + c; is easier to read and understand. FWIW, it is not sure if the Assign operator will be in the next release. FWIW, instead of class operator Add(ALeft, ARight: TMillimetre) : TMillimetre; I would rather use const, i.e. 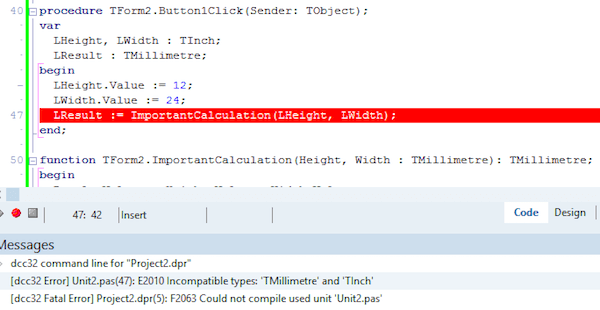 class operator Add(const ALeft, ARight: TMillimetre) : TMillimetre;. That gives you more efficient code generation. Good point, Thanks Rudy, I’ll update the post. I also debated inlining the methods, which I usually do, but didn’t want to distract from the main point. Might mention it in the next post.